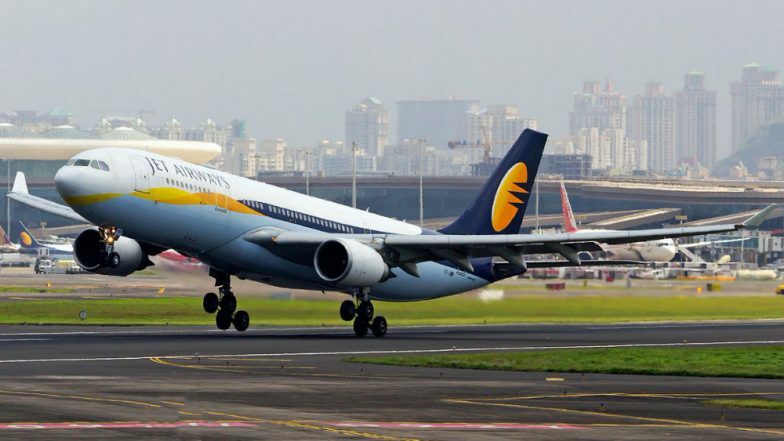 New Delhi, March 27: Nearly 80 per cent of Jet Airways' fleet is likely to be back in operation by the end of April, said Civil Aviation Secretary Secretary Pradeep Singh Kharola after the airline management on Tuesday assured the Ministry that it would re-induct 40 flights into its fleet by the end of next month. Kharola said the management has also assured the government that it would not ground any more aircraft from here on. The current management led by the State Bank of India (SBI) met the Secretary and DGCA chief B.S. Bhullar here on Tuesday. Jet Airways Crisis: 'No More Jets Will be Grounded', Says Ministry of Civil Aviation. "By Tuesday, Jet and the lessors should come into an agreement on getting back the grounded flights by the end of April. Jet would be able to fly 40 more aircraft. As on today, Jet is flying 35 aircraft," he said. A total of 75 aircraft are envisaged by April-end which is around 80 per cent of the Jet's total aircraft previously, he said. The meeting took place post the management takeover by the SBI and its subsequent Rs 1,500-crore capital infusion for emergency funding on working capital needs. The meeting on Tuesday was focussed on operations of the airline so as to avoid any hardship among the passengers, said the Secretary. The financial part of the problem at the airline are being handled by the lenders led by the SBI, he added. The Ministry's concern is to monitor and cater to the passenger demand during the summer schedule, without any steep fare hike and frequent cancellations. He also said the government is also keeping a close watch on the airfares and the Directorate General of Civil Aviation (DGCA) has suggested to the airlines not to resort to predatory pricing. "We have advised the airlines that they should not resort to predatory pricing," he said. On Monday, Jet Airways promoter Naresh Goyal stepped down and the SBI-led management took over the daily operations and cash flow. With Goyal's exit and the SBI leading a consortium of banks to take charge of the interim committee, Rs 1,500 crore was infused as emergency funding by the lenders to look at immediate issues. Around 50 of its aircraft were grounded due to inability to pay rentals. Its pilots and certain sections of the employees have been without pay for some months, leading the pilots to issue an ultimatum on salary payment to the erstwhile management. The airline owes Rs 8,000 crore to the SBI-led lenders consortium. The SBI expects Jet to find a new financial investor by the first quarter of next fiscal. Earlier in the day, the management of airline led by state-run SBI to oversee the daily operations and cash flow drew up a plan in consultation with the Civil Aviation Ministry to address the disbursal of pending salaries of employees, sources said. Jet Airways CEO Vinay Dube on the sidelines of the meeting said that the stakeholders of the cash-strapped airline are optimistic about the airline's future.